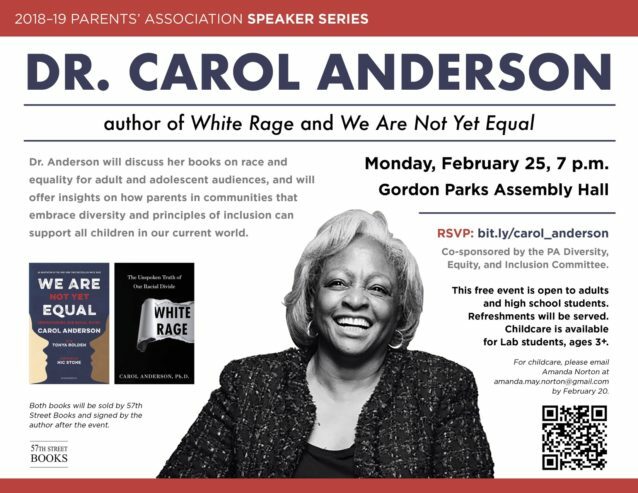 Dr. Carol Anderson will speak about her books White Rage and We Are Not Yet Equal, and offer insights on how parents in communities that embrace diversity and principles of inclusion can support all children in our current world. RSVPs are highly encouraged. The books will be available for sale and the author will sign books after the talk. This is a free, adults-only event, and childcare is available (for Lab children ages 3 and up is available). For childcare, please contact Amanda Norton by Wednesday, February 20.